Identification: A commonly used name is Tilapia nilotica. Distinguishing characteristics, synonyms, an illustration, keys, and a discussion of hybrids in Trewavas (1983). Distinguishing characteristics and illustration were also given by Eccles (1992). Photographs appeared in Axelrod et al. (1985) and Axelrod (1993). This species closely resembles Oreochromis aureus. 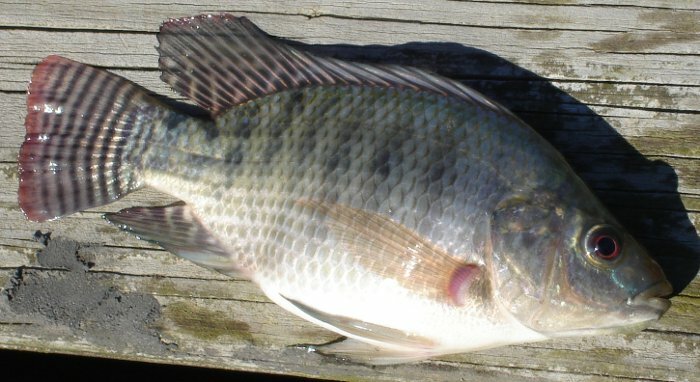 Before the two species were shown to be distinct, many or most accounts of "Tilapia nilotica" in U.S. ponds probably referred to O. aureus, likely imported from Israel (Trewavas 1983). In the U.S. and other regions where they have been introduced, tilapias have hybridized and introgressed in aquaculture settings and subsequently escaped into the wild. Reproductively viable hybrids have resulted from these various crosses and thus, for most tilapia populations in the U.S., the use of meristics and traditional systematics to assign species names to specimens is not useful (see: Costa-Pierce 2003). Native Range: Tropical and subtropical Africa, Middle East. Widely distributed in Nile and Niger river basins and in lakes Tanganyika, Albert, Edward, and George, as well as in many smaller drainages and lakes in western and eastern Africa; also in Middle East in Yarkon River, Israel (Trewavas 1983). Table 1. States with nonindigenous occurrences, the earliest and latest observations in each state, and the tally and names of HUCs with observations†. Names and dates are hyperlinked to their relevant specimen records. The list of references for all nonindigenous occurrences of Oreochromis niloticus are found here. Ecology: Nile tilapia is primarily herbivorous, with aquatic macrophytes, algae, and diatoms generally comprising >90% of its diet and the remainder including aquatic insects and crustaceans and fish eggs (Khallaf and Alne-na-ei 1987). Means of Introduction: This species was introduced for aquaculture purposes. It was introduced into open waters, likely through escape or release from fish farms. Status: Established in Mississippi. Possibly established in a large reservoir bordering Florida and Georgia. Established locally (Alachua County) in Florida. Reported from Alabama and Arizona. Impact of Introduction: Nile tilapia exert competition pressures on native fish and are known to prey on amphibians and juveniles of other fish species (Zambrano et al. 2006). However, Peterson et al. (2006) found little overlap in the diets of Nile tilapia and three native centrarchids (bluegill Lepomis macrochirus, redear sunfish L. microlophus, and largemouth bass Micropterus salmoides), with tilapia foraging at a lower trophic level (e.g., higher proportion of small benthic invertebrates and detritus) than native centrarchids (primarily consuming fishes and larger invertebrates). In Nevada and Arizona, the introduction of O. niloticus has resulted in the decline of endangered Moapa dace and Moapa white river springfish (Wise et al. 2007). Martin et al. (2010) found that Nile tilapia displaced native redspotted sunfish (L. miniatus) from preferred habitat in laboratory experiments, exposing the sunfish to greater predation pressure. Remarks: A specimen taken from Lake Seminole on the Georgia side of the lake near Saunder's Slough in 1991 was originally reported as O. aureus (Gennings, personal communication); however, all available specimens and photographs of tilapia from that lake have thus far proven to be O. niloticus (Smith-Vaniz, personal communication). Although O. niloticus has been reported from Texas, these reports were based on erroneous identifications of other tilapia species (Hubbs 1982, cited by Muoneke 1988). Reports of this species in Arizona also may be based on a misidentification. Minckley's (1973) figure 122, labeled as "Tilapia nilotica," and his description of their young, more closely match T. mariae (Courtenay and Hensley 1979; Courtenay et al. 1984, 1986). Grammer et al. (2012) found that introduced Nile tilapia in Mississippi live to ~4 years, confirming multi-year survival and establishment of this population. Nile tilapia have also been introduced into Thailand (Tongnunui and Beamish 2009) and El Salvador (McMahan et al. 2013). Voucher specimens: Florida (UF many specimens), Georgia (UF, UGAMNH), Mississippi (MMNH). Costa-Pierce, B.A. 2003. Rapid evolution of an established feral tilapia (Oreochromis spp. ): the need to incorporate invasion science into regulatory structures. Biological Invasions 5: 71-84. Courtenay, W.R., Jr., and D.A. Hensley. 1979. Range expansion in southern Florida of the introduced spotted tilapia, with comments on environmental impress. Environmental Conservation 6(2):149-151. Grammer, G.L., W.T. Slack, M.S. Peterson, and M.A. Dugo. 2012. Nile tilapia Oreochromis niloticus (Linnaeus, 1758) establishment in temperate Mississippi, USA: multi-year survival confirmed by otolith ages. Aquatic Invasions 7: in press. Hornsby, J. - Alabama Game & Fish, Montgomery, AL. Martin, C.W., M.M. Valentine, and J.F. Valentine. 2010. Competitive interactions between invasive Nile tilapia and native fish: the potential for altered trophic exchange and modification of food webs. PLoS ONE 5(12): e14395. Muoneke, M.I. 1988. Tilapia in Texas waters. Texas Parks and Wildlife Department, Inland Fisheries Data Series 9, Austin, TX. 44 pp. Peterson, M.S., W.T. Slack, N.J. Brown-Peterson, and J.L. McDonald. 2004. Reproduction in nonnative environments: establishment of Nile tilapia Oreochromis niloticus, in coastal Mississippi watersheds. Copeia 2004: 842-849. Smith-Vaniz, W. - Ichthyologist, U.S. Geological Survey, Gainesville, FL. Wise, R.M., V.W. van Wilgen, M.P. Hill, F. Schulthess, D. Tweddle, A. Chabi-Olay, and H.G. Zimmermann. 2007. The economic impact and appropriate management of selected invasive alien species on the African continent. Council of Scientific and Industrial Research Report Number: CSIR/NRE/RBSD/ER/2007/0044/C. Zambrano, L., E. Martínez-Meyer, N. Menezes, and A.T. Peterson. 2006. Invasive potential of common carp (Cyprinus carpio) and Nile tilapia (Oreochromis niloticus) in American freshwater systems. Canadian Journal of Fisheries and Aquatic Sciences 63: 1903-1910.